So, where do I start? I've always loved the idea of gel nails and I've had a couple of great gel manicures, but I'm one of those people who gets bored of the same nail colour and wants to change it up more often than every 2 weeks (not to mention the hefty price tag that comes with regular gel manicures), but at the same time I've always craved chip free nails that keep their shine. 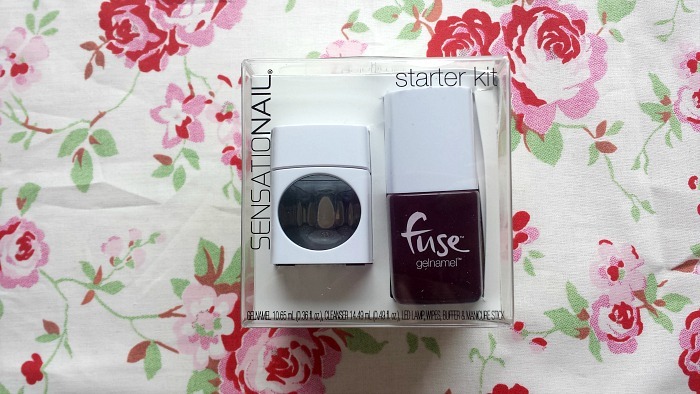 So when I got the press release through for Sensationail's newest product I was super excited to give it a go. Fuse Gelnamel is a gel-polish hybrid which is the world's first of it's kind, offering; around 7 days lasting power, anti chip technology and long lasting shine, with the added bonus of giving everything you need to get a speedy salon-style manicure at home. 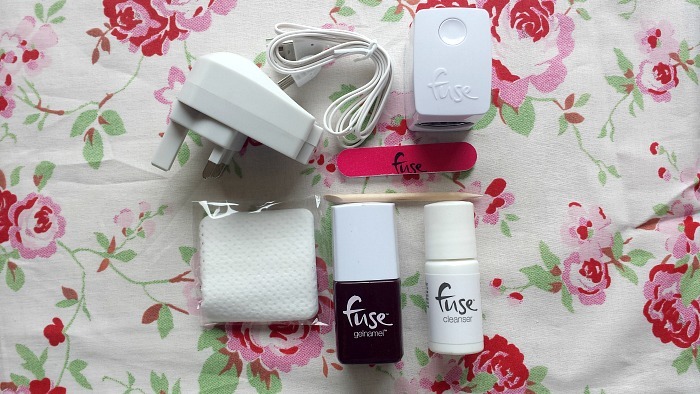 As you can see from the photo above, the Fuse Gelnamel Starter Kit* houses everything you need, including an awesome little LED lamp, which cures one nail at a time in 30 seconds. The lamp also flips out so that you can use it on your toes too! The kit is compact and perfect for travelling, with a handy USB power cable, so you can even power the lamp from your laptop! I'm not gonna lie, there are parts about this kit that I absolutely love (the adorable lamp being one of them), but there are other parts that annoyed me a little bit. Inside the kit is a little booklet, which gives you a simple step by step guide to each part of the nail. They stress the importance of doing all 3 steps to one nail at a time. Step 1: Push back cuticles. Buff entire nail. Apply cleanser to lint-free wipe and thoroughly wipe nail clean. Step 2: Wipe excess Gelnamel off brush on bottle neck. Apply one very think coat to nail, avoiding cuticle area. Lightly cap the tip of the nail with Gelnamel. Step 3: Place finger in lamp and rest in groove. Press button. Lamp will turn off after 30 seconds. Apply cleanser to wipe and gently wipe nail. So after completing the steps exactly how I was supposed to. I found that one coat was nowhere near opaque enough to wear on it's own. So on the rest of the nails I applied 2 coats before doing the final cleanse as the instructions say that you don't need to cleanse between coats. After 2 coats I found the opacity to be a lot better, but if I'm honest it still wasn't completely opaque (which is what annoyed me, because they boast the fact that you only need one coat). I don't mind too much because most nail polish needs 2 coats, but it's the fact it's a lot more time consuming as you're having to do one nail at a time and cure them for 30 seconds each coat. Anyway, here's how my nails looked after 2 coats..
As you can see, they are still slightly transparent, but maybe the coats I applied were a little bit too thin. I'll post an update the next time I play around with it and try the coats a little bit thicker. I did love how shiny my nails looked - a lot shinier than any other regular nail polish I own. 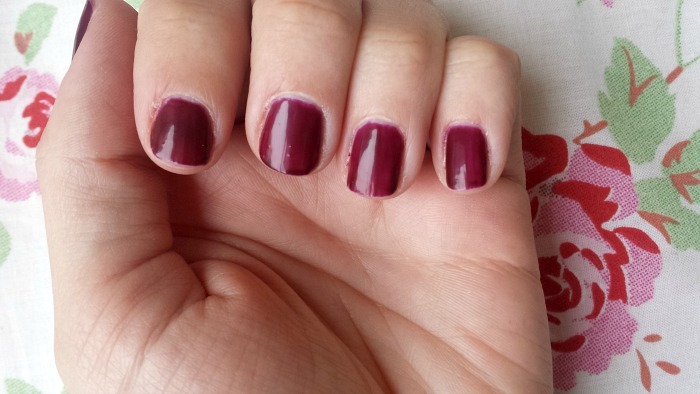 In terms of staying power, I found I had a couple of chips after around 5 days, so not quite as long lasting as they boast, but still better than regular nail polish (on my nails anyway). 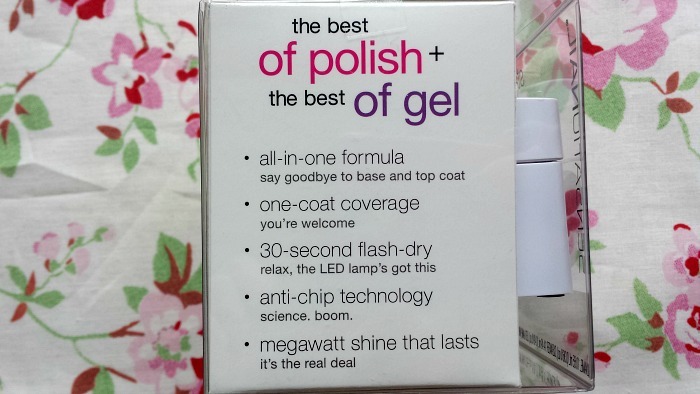 As with your typical gel manicure, this polish won't budge with your normal nail polish remover. To remove, they advise to slightly buff the nail with the black side of the buffer and soak your nails in warm 100% pure acetone for 5-10 minutes and gently push the polish. Again, slightly time consuming which just wound me up when all I wanted to do was get it off! Yes, I know I'm impatient. It's the price you have to pay to get a gel-like manicure from the comfort of your own home. I reckon the more I get the hang of this, the better my nails will look. I do hold out hope for this product and I'm definitely not going to let the removal process put me off. 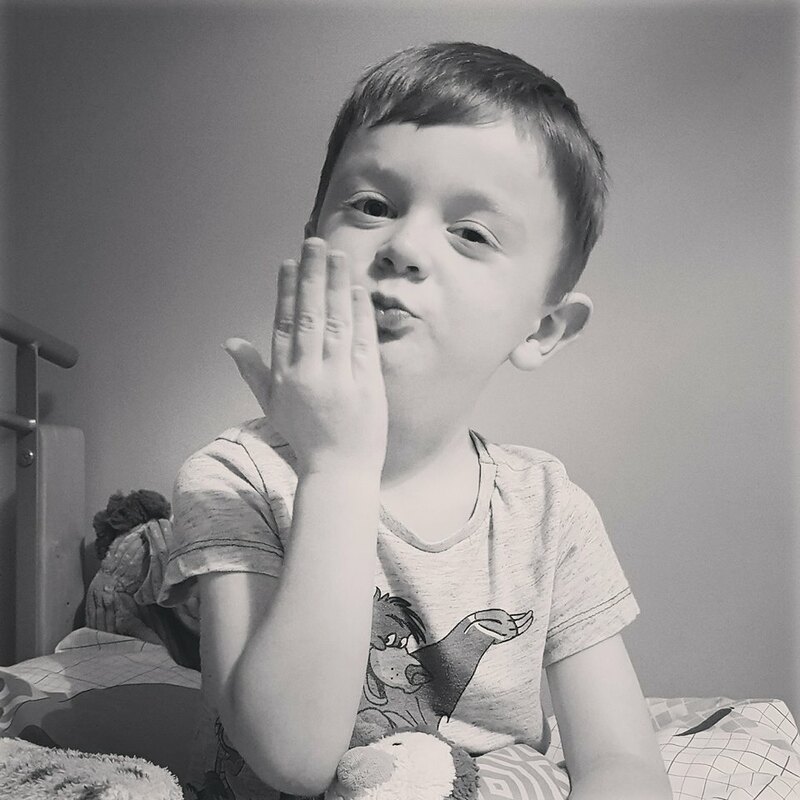 I just need to remember to allow slightly more time when doing it (maybe wait until George has gone to bed, lol). If you love gel manicures, but want the option to change your shades more often, I'd say to definitely give this kit a go. Fuse Gelnamel is exclusive to Boots. Starter kits are priced at £35, while individual colours are £15 each. 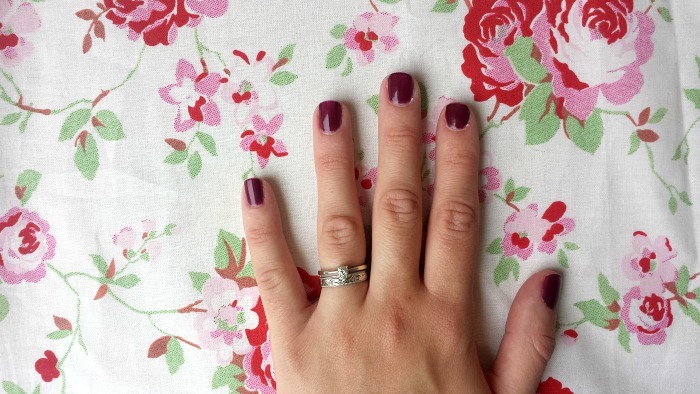 Are you a fan of at home manicures?